Do you like watching The Food Network as much as my wife Christine does? She's a bona fide junkie and I've actually grown to like many of the shows on there, too. Watching these professional cooking kings and queens do their thing making some of the most delicious food you've ever seen is fun. That's why the channel has been such an overwhelming hit with viewers over the years. 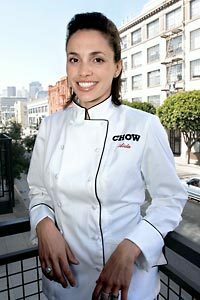 In Episode 37 of "Livin' La Vida Low-Carb On YouTube," Christine and I share with you about another brand new show (like this one I recently blogged about) coming to The Food Network beginning on August 2, 2008 at 12:30pm/11:30 CST--it's called "Ask Aida". Featuring the lovely and talented Aida Mollenkamp, the premise of this new show is to let Aida fix your culinary conundrums during her broadcast. She is soliciting people to send her a video of their cooking problems so she can help fix them. She's like a "Dear Abby" for the kitchen! Wanna see Aida discussing what she's looking for in her new show on The Food Network? Click here to access it now. Also, you can see my eggs video as well as my fried mashed cauliflower video (here's the recipe, by the way!) questions that I am asking Aida to help me answer. The producers are looking for energy, excitement, entertainment and engaging videos with interesting questions. So don't be shy! Give this a try and YOU could be appearing in this brand new television show starting in August. If you have any questions or simply want to submit your questions via e-mail, then send your feedback to AskAida@foodnetwork.com. GOOD LUCK EVERYONE! I just watched your youtube video episode 37, regarding the new network show Ask Aida. I'm looking forward to seeing if she uses one of your videos. This message is really for Christine, I had to bust out loud laughing when Christine ask you about calling her "this one". Too cute. My husband refers to me as his "Thing". Mostly he says I just love that "thing". Not "Sweet thing", just "Thing". No one ever called me a thing until him. You two are so cute together. Jimmy you are riot, in the egg video, with pouty lip. I hope they use that one. Regarding the cali hash not turning brown, most things "brown" because of the sugar in them like hashbrowns and buns etc.. Have you tried adding a bit of Splenda to the hash? Okay, so I'm no Aida, but I DID get my cauliflower cakes to brown!!! I cooked them in coconut oil (Spectrum Organics Expellar Pressed) - no, ZERO, coconut flavor!! And they browned up beautifully and got all crunchy just like my Gramma used to make 'em (only low carb)!! Oh my goodness, soooooo good!! Thanks for the idea - amazing what you can do with the humble cauliflower!! !